Not all udon is created equal. I thought it was just me who was having a hard time, until I surreptitiously looked around and saw that a few other diners were also struggling. Takeuchi Udon Ten’s noodles are thick and delicious. They are also surprisingly elastic, heavy and, to top it off, there’s a small mountain of them to get through. You definitely couldn’t accuse Takeuchi of holding back, but a little less volume would be enough. 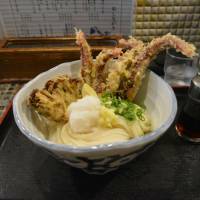 Located under the Shin Midosuji overpass, midway between Umeda and the Yodo River, Takeuchi is a small space and nearly always has a line at the front door. Fortunately, udon is fast food, so you shouldn’t be too long in waiting. The kitchen is nearly as big as the seating space, and it’s amazing to watch the staff work in this confined space. 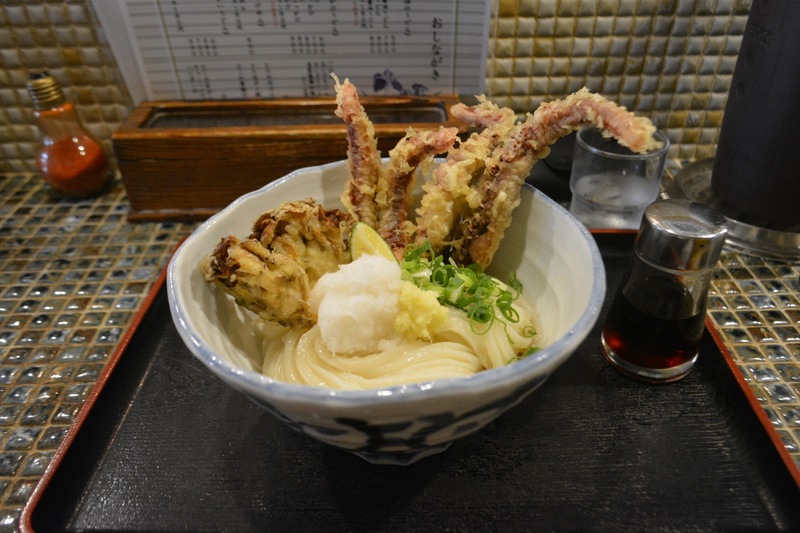 The udon menu runs from hot to cold, and there’s also tsukemen, where the noodles are served separate from the broth. Given the time of the year, everyone was ordering cold udon, many from the kijoyu menu, where the soy sauce is served separately. This is not your standard soy sauce for cooking; it’s a much weaker color, and is sweeter in taste. I had it with geso (squid tentacles) and shiitake mushrooms, both dipped in the tempura fryer. Hidden beneath the nest of noodles is wedge of sudachi citrus, which gives the soy sauce a zesty kick. Be sure to bring an appetite to Takeuchi, and a strong chopstick hand. 11:30 a.m.-2:30 p.m., 6-9 p.m.